Like that spicy buffalo wing flavor? 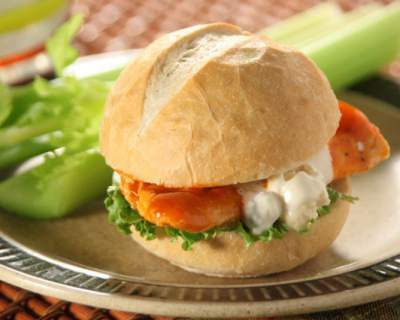 Make our Buffalo Chicken Sliders tonight. Bake rolls following directions on package. Flatten chicken breasts slightly and grill. Combine hot sauce and butter and mix well. Cut chicken to fit rolls. Coat both sides of chicken with sauce. Split rolls and fill with chicken, dressing and lettuce. Recipe and photo credit: Rhodes International - rhodesbread.com.